Jacks | Barbed Steel Charters, Inc. If these fish jumped during the fight, they would get a lot more respect than they do in the angling world. These fish hunt in wolf packs to corral unsuspecting baitfish, and once the baitfish are balled up, they crash through with reckless abandon, eating anything that moves. Topwater flies such as crease flies, poppers, and gurglers will draw vicious strikes. 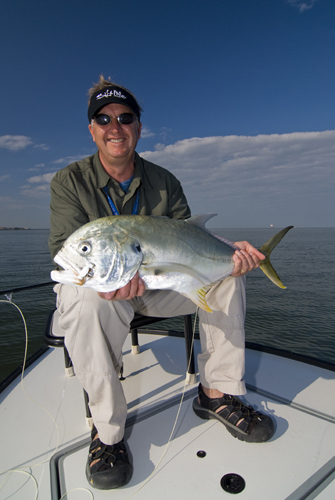 The typical jack runs from 2 to 5lbs with fish over 10lbs encountered at times. They usually make one or two good runs with the larger fish taking you into your backing. Once near the boat, they will take advantage of their broad bodies and swim in circles, putting maximum pressure against the angler. To subdue these strong fighters, one must try to get their heads above water in order to break their downward spiral. Once accomplished, they can be brought to hand relatively quickly.